These days traffic can be a problem in any neighbourhood. There are so many cars on roads that were never built to handle them and they all seem to be in a huge hurry to get somewhere that it can be very dangerous. We hear far too many stories about children injured and killed by motorists as they play in residential streets near home. What can a community do to help keep traffic safe? There’s not a great deal you can do without help or permission from the council, unfortunately. They’re the only ones who can install traffic calming measures or traffic lights, or even mini roundabouts, all of which are excellent ways to cut vehicle speeds and ease the flow.That severely limits your action. All you really can do is put up unofficial cardboard signs saying things like “Children Playing, Please Go Slow” or things along those lines. But you could also have people standing at the roadside, noting down the registration numbers of motorists who seem to be going over the speed limit. That can be quite unnerving for drivers, and after a few days you might well find that the average speed falls. But it’s only effective – or possibly effective – for as long as you do it. The truth is, too, that there’s very little you can do with the information. Telling the police doesn’t do much good, since you have no proof. But as a short term measure it can have its place. Situations like this are where a Resident’s Association can be invaluable. They have the resources to study traffic in the community and to work with and pressure the council to take steps that will help residents and local businesses (parking might also be a problem, for instance). Something they can do is consult with the community as to what measures they’d like to see implemented that might prove effective. 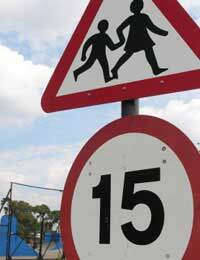 A reduction in the speed limit is good, but it might not work alone (although there are proposals to make the speed limit 20mph in all residential areas, which has been proven to reduce accidents) – you might also need traffic calming measures to enhance the effectiveness. They also have the clout to work with police on legal measures to make motorists slow down (radar guns and so forth). The thing to remember in all this is that it can be quite difficult to make official bodies take action. Sadly, that often only happens after an injury or a death – which is exactly what you’ve been trying to avoid, of course. Of course, if you have a school in your community, there will be a 20 mph zone around it, although these days you might be hard pressed to receive the funding for a lollipop lady (or man), although funding it could become a community project. You might, though, be able to persuade the council to put in a zebra crossing outside the school. The likelihood is that you won’t be able to persuade the authorities to install a speed camera in your community, but if the traffic problem persists, it can be worth at attempt.It’s worth taking all the possible steps to cut traffic speeds in your community, though, as the problem is only going to worsen with more cars and drivers on the roads.